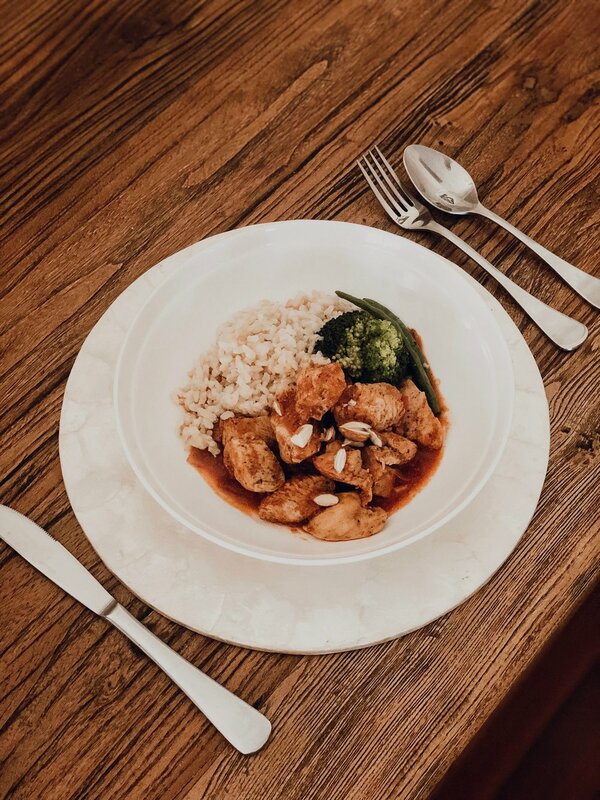 A spin on the ole faithful, deliciously comforting traditional butter chicken, this recipe balances great flavour with nutritional benefits to boot. This recipe reminds me of my family, laughing and bonding over beautiful food… I hope you can make wonderful memories over it, too. Enjoy! Chop chicken breast, and place in a large steel bowl. Add garlic, ginger, coriander, cumin, garam masala and Greek yoghurt. Mix well and place in fridge for 4 hours to allow flavours to mix through the chicken. Once well marinated, dice and fry onion in a large fry pan. Stir through chicken mixture once onion is glassy. When chicken is near cooked, add passata and chicken stock. Allow to simmer for 15 minutes. Stir through coconut cream and allow to simmer for a further 5 minutes. Serve this dish with brown rice and your favourite green vegetables.